1. Search the Font Awesome Free library for the icon you want to use, and click on the icon. 2. 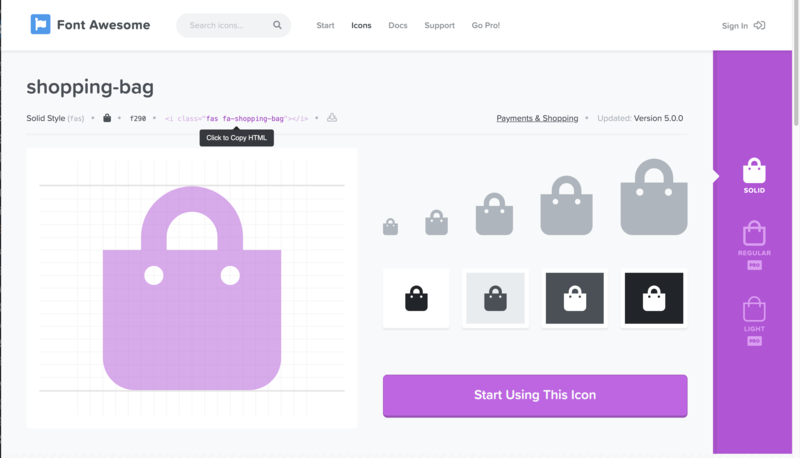 On the icon page, look for the HTML for that icon, highlighted in purple above. Click to copy the HTML. 3. Next, edit your WordPress menu. Expand the menu item by clicking on the arrow to the right, and paste the HTML code in the navigation label. Don’t forget to add a space between the code and your text as well! You can see an example of how this should look, above. This particular example adds a shopping bag icon next to the “Shop” menu item. 4. Finally, save your menu — above is the final look on our Rania theme!